Earlier this week, San Antonio, Texas celebrated its Tricentennial – 300 years! 300 years might not sound like much to readers in Europe, but here in the states, that’s a big deal. Fortunately, I can help them celebrate as I am still sifting through the pictures I took while attending the AIIM Conference in San Antonio. If you’re wondering how many doors I photographed, keep in mind that we were still experiencing winter in Connecticut and San Antonio offered me the chance to wear shorts, walk early and eat breakfast tacos. The first morning in the city, I had decided to go see The Alamo. I wrote earlier about the fact that that didn’t take too long. Fortunately, the area around The Alamo offered many interesting doors. I think it’s appropriate to include them with the Alamo doors, because, many of the buildings I was viewing stand in what would have been part of the mission/fort/complex in the mid-to-late 1700’s. The Alamo, was originally the Mission San Antonio de Valero, and was founded by the Spanish near the headwaters of the San Antonio River on May 1, 1718. Long before the famous battle, the Spanish were fighting off the French who were approaching from Louisiana as well as the native American Apache, and Comanche tribes. You can read much more about the early history of The Alamo in this article. One of the Comanche elders was a man simply known as “Frampton.” He was responsible for maintaining the history of the tribe as they moved from settlement to settlement. He was famous for his detailed drawings of tent flaps. He made friends among the French settlers and followed them north along the Mississippi and Ohio Rivers and then north into Canada. I think you know the rest of the story. If you want to see more door photos, visit the Frampton site and look for the blue frog. There are some descriptions in the photo gallery today. You can start a slide show to read the full captions by clicking on any one picture. This door is to a building that appears to be used for events. It was closed to visitors. I wouldn’t want to exit that door. Fortress Alamo – this was home to some museum space displaying numerous artifacts. Gates, doors and windows. Beautiful workmanship, especially considering the period. There is a very long line waiting to get inside these doors. The delay is because the flow is metered. As you approach, they take your picture. Later, you can buy it for about $30. I did not buy mine. One of the gates in the perimeter wall to the Alamo. This is inside the long building that housed the barracks and the hospital. The hospital was behind that door. The Spanish Hospital. I can only imagine the quality of medical care those poor wounded men could expect. This is the Post Office and Courthouse. Originally, this would have been inside the mission boundary. Another side entrance to the Post Office and Courthouse. Not my hotel, but I like the entrance. Including this for Joey. Side entrance to the Post Office and Courthouse. I really like the look of this building. It’s being renovated, which is a good thing. This is a side entrance to the Post Office and Courthouse. This is the construction entrance to the building being renovated. Thanks Ruth. Have a wonderful day! I’ve seen temps hit over 100 there. Too hot for this boy. Louisiana gets pretty hot, too as I recall. I’ve only been to either in the spring. Not sure I could handle the summer. “I” vs. “O” is my second most favorite typo (after s/d). I was going to fix it once I got to my laptop. If any place in Texas had great doors, I suppose San Antonio would the best bet!! Good job, Dan! Thanks GP – they were just everywhere. The ones on that courthouse just kept snagging my attention. They are all similar, but not quite identical, or in a different entrance. They just seemed to call “me, take me” – I still have so many doors from that trip. I’ll be sharing a few next week, then taking a break from Texas for a while. Looking forward to it, Dan. I’ve never been to Texas! The door you wouldn’t want to exit, what is it for? Somebody could fall from it and get seriously hurt. I came across one like that sometime back in an architectural drawing we were given to use for our electrical layouts. Usually it is not my place to question the architect, but that day I called her and asked politely her if it was perhaps a mistake. She said it was. It was supposed to open into a balcony but the balcony was not there. She corrected it later on and re-sent it to us. I’m not sure what that door was for, or, if perhaps it’s just a large window. It also could be a place to shoot through. Originally, the Mission didn’t have a roof. That was added by the Army when they took it over. Then “renovations” were made to the walls, to make the fort defensible. Parts of the back wall were removed so that cannons could fire over what remained. This is on the right side wall, but I don’t know much more about it. I see them on modern buildings, where balconies have failed and have been removed. Often, they are bricked in – ghost doors. I wonder how many buildings built today will still be standing in 300 years. I wonder where that door high up on the building was expected to lead. I wonder . . . I’ll just enjoy the ride! I doubt anything being built today will be standing after 300 years. Not sure what that upper door is for, but I hope they had a chair in front of it. “detailed drawings of tent flaps” SMH You crack me up! Dan this is a very satisfying collection of doors. The ironwork on the courthouse doors is lovely. (I lived in Albuquerque when that city celebrated its tricentennial. I agree that it’s a remarkable age for a city.) Hugs. Thanks Teagan. Those courthouse doors were most impressive. They all seem a little different, which is why I included so many. 300 is a good long time for a city to be around. We have driven through Texas, but never stayed there. That needs to be rectified. Such great doors, Dan. Thanks Lois. And since you’re starting from Florida, it probably doesn’t matter when you go. I guess you’re used to the heat. I wouldn’t want to be there now. That one door would have a helluva first step, wouldn’t it?! Really like the door picking up reflections. And that’s a great shot of the fire escape. I like seeing them, but I would never want to go up or down one….especially down! It’s hard to imagine the horror that took place here all those years ago when looking at your photos showing such beauty and tranquility. It is always hard to imagine the scenes at forts and battle grounds. I remember walking through the large diorama at Gettysburg, and thinking how impossible it looked. The courthouse door with the reflections caught my eye. I kept moving around trying to get a good view without standing in traffic. Thanks as always for stopping by and leaving a comment, Ginger. Dan I hate to create a flap. Well not so much as I will resist. Where is the buffalo hide flap with a detail of the hinges ? Not to mention a nice trail side view of the edifice ? Were there too many elk walking by to get a good image ? Or is that being saved for another historical post ? We’ll have to circle the wagons and come back to those images, John. Nice post Dan. The one you wouldn’t want to exit sure is a head-scratcher. I’m gonna just assume that at one point there were stairs or a ladder of some kind. Thanks Norm. It certainly is a long way down. Maybe it’s a window, but it sure looks like a door. 300 years is an amazingly long time for any city to be around, here or in Europe! I like all your photos, but as usual prefer the door with arches of some sort. Just like that look, I tell you. I love doors within arches, Ally. I left a lot on the cutting room floor, but I just kept really liking the courthouse doors. Thanks. I visited the Alamo with my parents when I was a little boy, I’d like to go back. Great photos! I am very glad I made the visit. I’d like to go back to San Antonio at some point. Either that, or someone around here needs to start serving breakfast tacos. Perhaps we were there at the same time, Dan! Great selection of doors! That would be funny – thanks! Thank you – I’m glad you think so. So many doors are familiar here! One of my neighbors who had never been to San Antonio went a couple of weeks ago and complained about the heat. So I think it’s great that you went earlier in the season. While NE was still cold what a treat to walk in summer clothes. And breakfast tacos are definitely a staple of the west. We were lucky since it was off season and we got a top room. The view was amazing and the room very cool too. it’s an historic place with upgraded rooms but there is still a distinct old flair which we both loved. And yes, in American standards, San Antonio is an old town packed with history. We always pick it as a stop, unless it’s during weekends and holidays when it can be too crowded and loud. I can understand why you would pick it as a stop, I’d like to go back when I have more time to explore. But, yes, in the spring or fall, for sure. That’s pretty cool that you stayed in that hotel. I do like the look of it, and it’s a little more central that the one by the convention center. And yes, the location allows you to go everywhere without a car. Always nice. I found the Alamo to be a very sad place. Sort of like Fort Sumpter – neither are places I’d want to be surrounded in! Norm was at the Alamo – oh my. It is a sad place when you stop to think about it. I was there when a couple of elementary school field trips were going on, so it was hard to be to solemn. Ok, I admit that you had me going for just a bit with that “Frampton” story. Duh. I visited the Alamo long ago (maybe 25 years ago?) 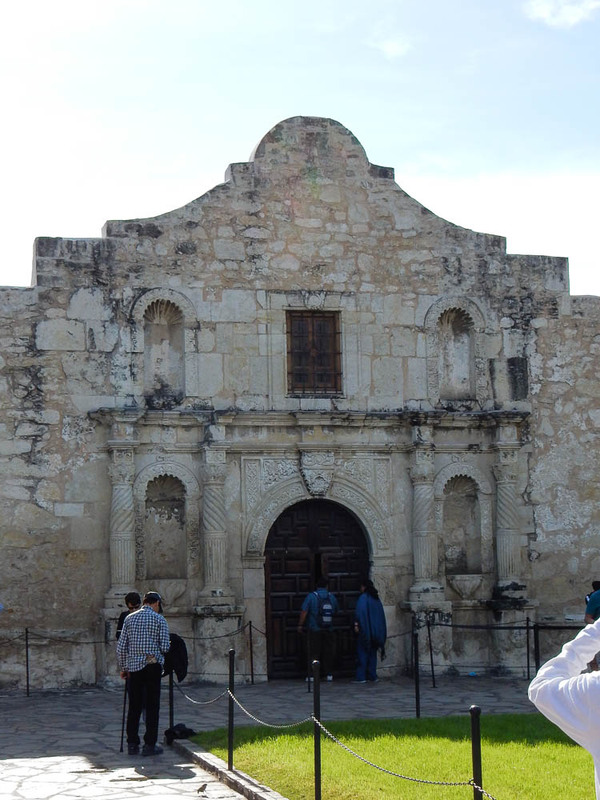 but I don’t have much recollection of the building (I remember the Alamo… just not well 🙃) except that it was smaller than I expected. Great doors. Thanks for the link to the history of the confrontation. It was smaller than I expected, too, but I guess only a small portion has been preserved (understandable, since it sits on some prime real estate). I’m always messing with Norm. Thanks. I’d encourage you to give him a character. I skip some weeks, but the more the merrier. I started doing it to call attention to the challenge. I like the fire escape, and the building being renovated too. It has great windows. Thanks Deborah. I do like that building that’s being renovated, I think it will be beautiful when complete. I don’t think there’s a door on the fire escape, but I love looking at them. Thanks John. Did you get there in time for a breakfast taco? No unfortunately I was running late in both directions. I only had an apple. Then dinner when I got home. I’m loving the side entrances to the post office/courthouse. This is an entrance done well!! Thanks Joanne. I’m glad you liked this. The Post Office / Courthouse is a fascinating building. Are you still on the trail? I’m glad you have some time to enjoy. I think you worked hard enough. Thanks for taking us along for the ride. So much has changed with this memorial, makes me sad to think of it. We visited it in the sixties. This was my first visit, so this is the benchmark for me. This was such a treat, Dan. The detail in the architecture surrounding the main door to the Alamo is impressive. I can’t imagine the tools and conditions 300 years ago. Great doors post. I’m glad you took lots of photos! Thanks Jennie. When I consider the tools I have today, compared to 40 years ago, it’s hard to imagine what it was like to work 300 years ago. Exactly! And their results were often better than today’s architecture. Thanks Amy! I’m glad you enjoyed this. I really think the post office produced the best doors, and not just because of those righteous lamps, either. The contrast with the stone and mortar is dreamy, and the metal accents are workin it. Arches and reflections, and yeah, those righteous lamps. Love the post office. I’m glad you liked those doors. I had more Alamo doors, but they were blah, and there’s only so much Alamo I can write. As I moved around that building, I just kept liking the doors. I love stone and arches and the reflections really caught my attention. I’m glad you liked the lamps too. I second what everyone else said about Frampton. LOL! I would never pay $30 for a photo of myself entering the Alamo due to the fact that I don’t necessarily like photos of myself that are free. Awesome door post, Dan. Lovely photos. I would be interested in seeing the inside of the hotel as I imagine it might have an interesting décor. Yeah, they gave me a link to look at the photos and I wasn’t impressed. Besides, I don’t need to prove that I was there. Evelyne (above) stayed in that hotel. It sounds like a pretty cool place. I hope you have a great weekend – thanks (as always) for taking a look here. I’ll have to check on Evelyne’s comment. I didn’t have time at lunch to read all of them. 300 years is a lot of history, Dan. Loved your photos and the links, thanks. Thanks Jean. It’s about as much as you’ll ever find around here. I’m always happy to see you stop by, Robin. I know you’re busy and you have grandchildren to visit. I love history, do these places hold my interest for a long time. Oh, great doors, Dan! Plenty to rest the eyes on. This is old by any standards, and it shows. I love the reflection towards the end very much, and the funky stairs. Oh and that door way up! Thanks Manja. I couldn’t stop taking pictures of the courthouse. I’m glad you like them. Also, 300 years is not a big deal for Indians as well. I mean we are like 1000 years old, 2000 thousand years old and sometimes even before that. However, I think there is a plus side to not having such old history. I may be wrong here so correct me if I am. Having such an old history is good, you know your roots and all that. However, it also means that there is a huge distortion of history happening over a period of time. No one can tell for sure what really happened 2000 years ago accurately. Anti-social elements and politicians use this distortion of history as a tool to win votes. And that’s why many Asian countries are still third world countries. That’s an interesting hypothesis. On the other hand, politicians seem capable of distorting events that happened last week, so I’m not sure how much difference it makes. I do imagine it’s easier when the events occurred so far in the past, but until someone invents a time machine, history will be written (and rewritten) by the victors. Even if we put aside the politicians angle. There’s another issue – The People. For instance, a festival that has got nothing to do with religion (but for national independence) becomes a part of religion and culture because the previous two generations have been following it as religious practices. Now, the third generation ‘believes’ what the previous two generations believed. The fourth generation will follow that and the fifth as well. So historically, an temporary event for national independence distorts into a religious practice because somewhere down the chain of events few generations tweaked it. In other words, it’s kind of Telephone Game/Chinese Whispers. I’d like to see San Antonio. My husband spent several years there when working in mobility in the Air Force. I’d have my own personal guide. That’s the best way to see any city! These are your best doors. They represent our American history. Thanks. I wasn’t the best history student, but as an adult, it has been my favorite subject.